Since the iPad burst onto the scene in 2010, the popularity of tablet computers has skyrocketed. 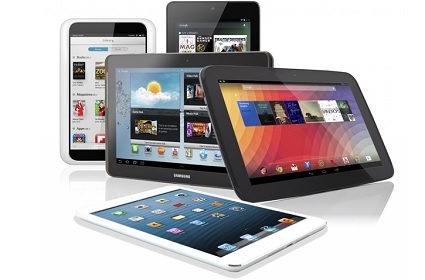 In fact, tablets have become so popular that this year they are expected to outsell traditional PCs and laptops. But being popular doesn’t make a tablet any easier to buy. In contrast, the dozens of tablet options available from over 25 different manufacturers arguably makes selecting a tablet more difficult than choosing any other digital device, including a laptop, a camera, or even a smartphone. How will the tablet be used? There is a world of difference between looking for a tablet to keep your pre-schoolers entertained and searching for a tablet to help you complete those challenging marketing assignments for work. The hardware and software specs for a work-related tablet – Is there a keyboard option? Can I print? – are totally different and should take precedence over the number of built-in games or the quality of the front-facing camera. In contrast, if the main user of the tablet is going to be sticky-fingered child with a habit of leaving things on the school bus, then that should point you in a different direction. Keep in mind that pretty much every tablet is good for accessing e-mail, surfing the Web, playing games, or watching the occasional movie. It’s the special tasks – or in the case of your child, the special handling – that should determine in which direction you go. Where will the tablet be used? If the tablet will only be used at home or occasionally at the local Starbucks, then you can narrow the choice considerably – and save yourself some money – by looking for a Wi-Fi-only model. However, if you plan to use the tablet on your daily commute or you have to get e-mail and surf the Web when you travel, then you should look for a cellular model. Although cellular tablets invariably cost more than Wi-Fi-only versions, the monthly wireless access charges are usually quite reasonable. For example, a tablet can be added to a Verizon More Everything plan for just $10 per month with no long term contract. Does your tablet need to be compatible with other devices? This is important, particularly if you want to access files and other data from different devices. With better access to cloud storage, it’s inevitable that individuals are gravitating towards personal tech ecosystems. For example, if you already use a Mac and an iPhone, it makes perfect sense to get an iPad, so all your photos, music, videos and apps are available on any of your devices at any time through Apple’s iCloud. Similarly, Android smartphone users might want to favor Android tablets to take advantage of Google apps and Google Drive, while Windows Phone users might want to look at a Windows 8 tablet for compatibility and the OneDrive option. One you have determined use, connectivity, and operating system, it’s time to look at a few other specs. The obvious ones are screen size (and resolution) and battery life but there are plenty of other key features that can make a difference between enjoying your tablet and really enjoying your tablet. Are you going to use your tablet to take pictures or shoot a lot of video? Will you need extra storage? Is weight a factor? How about built-in speakers? These features could be important or they could be non-factors, but a comparison of specs – and built-in apps – is a great way to narrow down the field even further. Last, but certainly not least, is the question of how much you have to spend. Again, the person using the tablet might be a big determining factor for your budget. If the tablet is for the sticky-fingered kids, then a $159 Kindle Fire HD might make more sense than a $399 iPad mini. But if it’s for your daughter going off for her freshman year at college, then you might want to spend a little more to encourage those Sunday morning FaceTime chats. As mentioned above, there are now dozens of tablets to choose from but narrowing them down to a fairly manageable number is not that difficult. Ask yourself a few questions and take the time for a little research and you will end up with a tablet that you will love!